The sedentary work environment is finally changing. Many Americans spend their days sitting at their desks with little to no physical activity. Businesses have started to see the benefits of having their employees abandon traditional desks and replace them with biking desks, or, deskcycles. This transformation is seen in many forward-thinking companies and has created a lot of buzz. 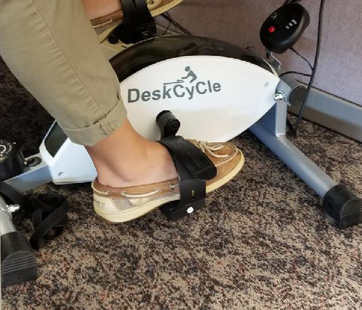 Studies have been conducted using desk bikes or pedal machines in both a work and academic environment. One study found that workers who pedaled more had increased concentration at work and were more productive. Also, those who were more active were more likely to use the DeskCycle throughout the day compared to those with lower daily activity. An article by NBC examined a study done at a university and found that students using the FitDesk were more positive and the machine kept the students engaged. This caused the university to invest in 12 FitDesks for a campus library in order to give students alternatives to the traditional desk. After reading articles and studies on both the benefits and misconceptions of these pedal machines, I thought that deserting the sitting culture would be a positive change. But, I needed first-hand experience before I could truly decide. 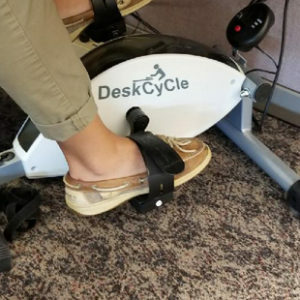 The HR department sent a pedal machine up to the communications team here at TDS to try it out and see how we liked it. So the pedal machine made its way through the communications team and there were some mixed reactions. I found the machine to be useful if done for an hour per day on average, and I saw only a few drawbacks. First, I have long legs, which resulted in my knees hitting the top of my desk every now and then. Second, using a DeskCycle with a chair on wheels can be difficult because the attachment strap provided to prevent movement isn’t the most effective. However, I like being able to casually pedal as I worked on some of my projects. One positive is that it’s quiet, which ensures that the pedal machine won’t be distracting to those around you. Also, there is the convenience of tracking your data like distance, calories, and time. The change is for the better, but there are some needed improvements before all traditional desks can be replaced. Why take the elevator up to your office when you can be active by taking the stairs? Get a secret leg workout in while sitting at your desk. While seated, straighten both legs and hold for five or more seconds. Then lower legs back to the ground and repeat for 15 reps. Lift your shoulders up to your ears, hold for 5 or more seconds, then release and repeat 15 times. Sitting up straight, stretch your shoulders back so your shoulder blades are closer. Hold for five or more seconds and repeat for 15 reps. Adjust your chair to make your feet, hips and arms at 90-degree angles with the floor. This will ensure that you keep good posture throughout the day and will engage the core to make sure there is no slouching. Want more web traffic and shares? Add long-form content!